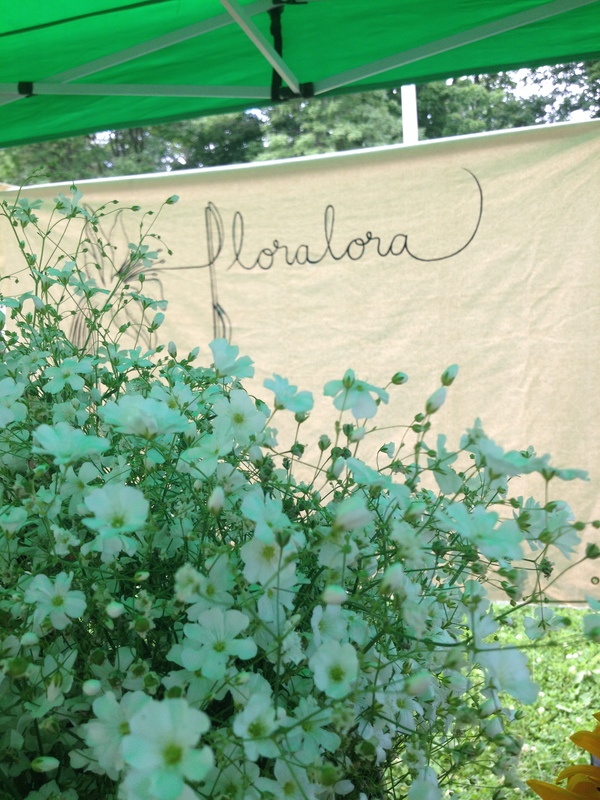 Sas and Jamie from Floralora Flowers bring beauty to our market every Tuesday with their selection of gorgeous local, organic flowers. Jamie shed some insight into how things began and how she got started working for Sas this year. 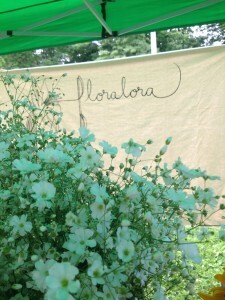 www.floraloraflowers.com/. Jamie: I will need to speak on behalf of Sas, she was the one who started it all. She had been working at Vicki’s Veggies, another market favourite, and through that developed this dream of opening her own floral farm. That happened two years ago – the first year she rented land in Prince Edward County, and this past year bought four acres of land and owns her own farm now. Michelle: That’s amazing! Good for her, that’s something to be really proud of. Jamie: Ya! So her mandate and the mandate of the company is to provide locally grown, fresh, organic flowers to the market because there’s not a lot of that around. Michelle: Definitely. People regularly think about buying local and organic in terms of food, but its important to think about that towards flowers as well, for the health of the environment and your own health. Jamie: Yes! There’s a growing awareness of the importance of products being local and also being safe and good for the environment. So that is really important to both of us. Michelle: How did you personally become involved with Floralora? Jamie: I found out about the internship opportunity with Sass on Instagram, of all places, applied and was hired. I’ve been there since May, and we’re brainstorming about how we can work together moving forward. Michelle: It seems like you guys make a great team. Jamie: Ya! It’s been really fun working together. I live on the farm. We work a lot in the summer, because the growing season is only from May to October, so during those months it’s a bit crazy. Then in the winter we have time to plan for the next year and the next season. It’s nice that it’s seasonal because it gives us time to rest. Michelle: When the plants sleep so do you. Jamie: (Laughs) Ya! We also do a subscription-based business as well. So people can sign up to receive a bouquet or a bucket of flowers. Michelle: Do you deliver them straight to their door? Jamie: Right now it’s for market pickup, but next year we’re hoping to have a delivery service. We also do wholesale sale to florists in Toronto right now, as well as events and weddings. Michelle: Oh my gosh you guys are so busy. Jamie: Yes definitely. So farmers markets are fun, and we love them, but it is a small part of everything that we do. Michelle: I feel like it would be less stressful, more social than the rest of the business. Jamie: Yes, it’s our fun social time, a nice break from the fields and all that. Michelle: What do you like most about the markets when you’re here? Jamie: Previously just being a customer at farmers markets, I never got to see what goes on behind the scenes, like the relationships between the vendors. I’ve really loved getting to know my vendor neighbours, and when people have extra we share with each other. It’s an amazing community of farmers and vendors who are really proud of what they’re doing and really impressed by each other. Michelle: That’s such a nice sentiment Jamie. Alright, lastly, what is your favourite flower? Jamie: Oh gosh it changes every day. Right now, maybe Scabiosa, also called pincushion flower. Michelle: I’m sure it’s hard to choose just one. Alright Jamie, thanks a lot – We’ll see you next week! Sean is one of four individuals that opened The Local GEST restaurant in Cabbagetown, and promotes the farm to table movement in a very realistic way. www.thelocalgest.com/. Michelle: So how did you begin with the Local Gest? Sean: We bought the Local Gest on Parliament Street – 424 Parliament Street to be exact. The name stands for an acronym for the four owners – Gary, Eric, Sean and Tiffany – the only thing missing is U! (Laughs). What we decided is we wanted to bring the farm to the fork. We just celebrated our second anniversary in August. Sean: Thank you very much. The first year we were up at the Lansdowne farmer in the city plot, and this year we decided to go crazy and lease a one-acre plot from the Elm Grove Collective which is just south of Sutton. Since May we’ve been bringing the majority of our produce from the farm and using it in specials or having it included on our menu as much as possible. Our salad now is made up of 90% Local Gest Farm veggies. Michelle: That’s awesome Sean, very admirable. Sean: Ya. So essentially our goal was to bring something different to Cabbagetown. There’s a lot of pubs in town, we took over a pub, we’re really trying to focus on being a restaurant. And we got to meet the some of the people starting this market back up again, who have all ate at our restaurant. Michelle: We sure have – Delicious food! 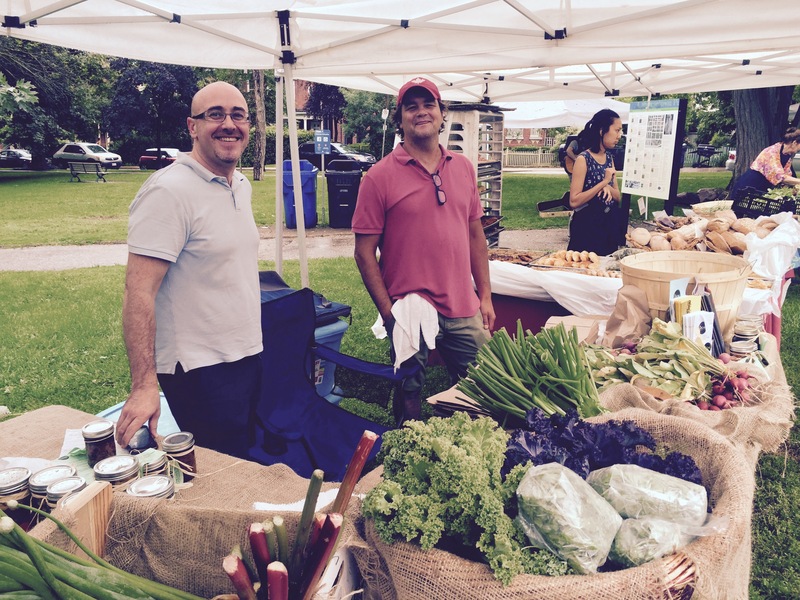 Sean: And got us interested in the Cabbagetown market, which we are huge supporters of, love what you guys are doing. Michelle: You also have a market of your own as well too right? Sean: We do. We sell our produce out front of the restaurant from 12 to 4 on Saturday afternoons. The produce that we have as well as our pickled stuff – our pickled beets, jalapeños, beans, as well as seasonal things like strawberry rhubarb jam and chutney, fresh basil pesto, things like that. It’s been a great summer. Michelle: It sure has. Do you have a favourite memory from the farmers market? Sean: Not specifically…. What’s exciting is that we can talk about how different it is from last year. Obviously a lot of Cabbagetown residents have been here for decades, and they have been talking about the disappointment of last year, so it’s really exciting to be able to tell the people of Cabbagetown how different it is now – how exciting and vibrant it is now. You guys have done a great job. Michelle: Well thank you so much, we’ve loved the positivity from the community that has come from it and we’re so happy to be able to do it. So at this moment Sean what would you say is your favourite Ontario produce and how do you like to eat it? Sean: The beets, pickled with a little maple syrup. Also I really love customers get so excited about the produce they get from us and bring us in a sample, it’s always a nice perk! Michelle: (Laughs) I’m sure that is! Well we love your enthusiasm every week. Thanks for all your support.